Conditioner is always a good thing, right? Sure…until you use too much of it. Much like the sun or chocolate chip cookies, too much of a good thing (in this case, conditioner) can be damaging. When it comes to fine hair, an ultra-moisturizing deep conditioner can actually make your hair look worse. If you’re looking for a conditioner for fine hair, we’ve got a few recommendations (and tips) for you. First, examine how frequently you are using conditioner. If you’re doing it every day, take a step back and let your hair breathe every now and then. Conditioners typically weigh fine hair down and keep them flat. Try a leave-in conditioner and only use it on the ends of your hair. 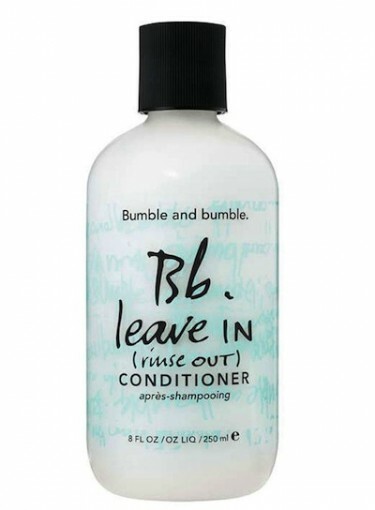 We like Bumble and Bumble Leave In (Rinse Out) Conditioner ($26), which, as the name suggests, can either be left in or rinsed out. If you hate to give up your hair mask ritual, the good news is you can keep it around. Fine hair is prone to breaking, especially at the tips. We like Bosley Healthy Hair Strengthening Masque ($39) because it contains biotin and proteins, which are great for strengthening your hair. The trick is to just use it on the bottom half of your hair. If you have severely damaged hair, read Summer Skin and Hair Repair to get the deets on mending your hair. For years, we’ve heard from hair commercials and professionals alike that moisturizing is of the utmost importance. But if you have fine hair, your natural hair oils will nourish and protect your hair — if you let them. So when it comes to conditioner for fine hair, remember that too much of this good thing will actually just make your hair greasy and limp. To read about more hair care routines that do more harm than good, read 14 Hair Myths — Busted.